Lily Pulizer Endless Summer from Brilliant Graphics on Vimeo. Brilliant helped Lilly Pulitzer apply a soft coconut fragrance to their Endless Summer catalog for a full sensory experience. Studies show that incorporating scent has a profound impact on how consumers regard a brand, and encourages them to linger. Invisible to the eye and applied over Brilliant’s exceptional printing, the gentle aroma transports clients to Palm Beach for a uniquely Lilly experience. 6″x10″ finished size with a fold-out cover. Printed in four-color process with a custom blended yellow and uniquely formulated fluorescent “Lilly” pink. Custom formulated Coconut Water fragrance. Scent encapsulated varnish applied to the inside back cover. Gold foil stamping on the front cover. 100# Sterling Premium Dull Cover. 80# Sterling Premium Dull Text. Our sense of smell is deeply connected with the parts of our brain responsible for memory and emotion, providing an important opportunity to connect deeply with consumers. In this case, Brilliant formulated a custom fragrance to help Lilly communicate a warm, sunny, beach vibe. 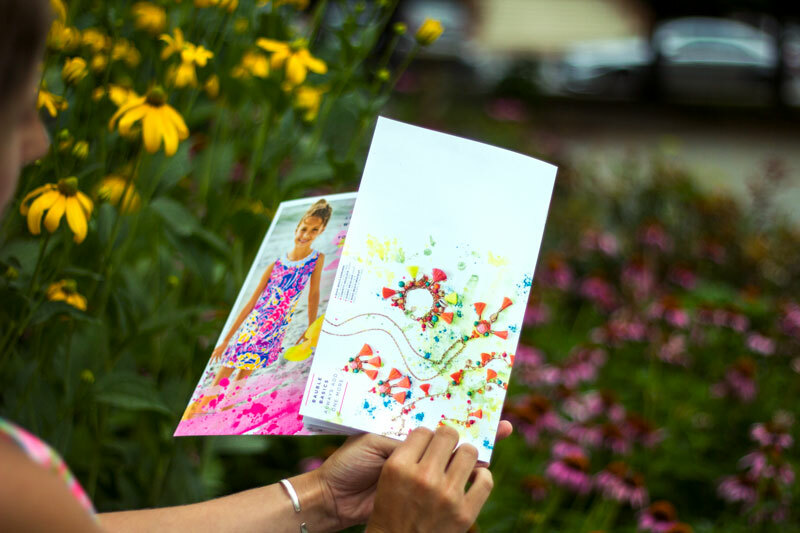 By appealing to this powerful sense in combination with a stunning visual presentation, we’ve ensured this printed piece will grab consumers attention, boost sales, and further Lilly Pulitzer’s brand image. Appeal to your clients senses by adding Brilliant’s customized scent application to your printed piece.